Skiing has a reputation as an expensive pursuit, but it need not break the bank. With some thrifty forethought and careful research, it is possible to plan a skiing holiday on a tight budget. 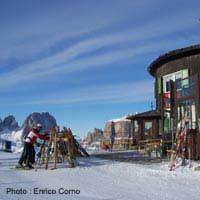 When it comes to skiing, a whole host of accommodation options are available, catering for varying budgets. Whilst a full or half board hotel might be the obvious choice, alternative arrangements can prove significantly cheaper. Self catering will save on food costs, providing you buy ingredients from the local supermarket and cook cheap and tasty meals in your chalet or apartment rather than eating out regularly. Some self catering apartments or chalets can also be rented at a set cost for the rooms or building, rather than at cost per person. If you are travelling in a large group and are happy to spend plenty of time around others, this option can cut costs considerably. Be sure to check whether the property owner is happy with such an arrangement.Those with a real passion for skiing could even consider become a resident instructor for an extended period of time. Accommodation is usually included as part of the employment package. You may even return home with a healthy quantity of cash, if you teach on a regular basis. In skiing towns, hotels and restaurants abound. Eating out each night, however, is likely to make a significant dent in the contents of your wallet or purse. Consider buying some picnic-style food and a bottle of wine from the local supermarket on a few evenings. It can be an enjoyable way to try local, everyday foods. If your accommodation lacks kitchen facilities, simple spread a cloth on the floor of your room and have an indoor picnic. This can be great fun, particularly for children. During the day, be sure to carry healthy snacks like nuts and fruit. Take a water bottle, too, if possible. Buying snacks on the slopes can eat up your holiday budget. If you are able to travel off peak, outside of the high season and school holiday periods, you may find this more cost effective. Many resorts and hotels drop their costs at quieter times. In addition, you may find that booking at the last minute uncovers some bargains. If your arrangements are flexible, you could make some significant savings.Hiring skis and clothing can prove expensive. If you have your own, take them. Be sure to check excess baggage costs, but these are likely to be significantly lower than the savings you could make on hire costs. Hiring salopettes can also be costly. A good tip is to contact local charity shops and see whether they have any for sale. The clothing on offer may not be entirely to your taste, but you’ll only be wearing it for a week or two. You might even find some stylish, retro ski gear has been donated.Teaching and insurance are two areas that prove more difficult to skimp on. If you are travelling as a family, or with several friends, you may be able to secure group deals or discounts. Whilst it may be possible to find cheap flights to your skiing destination, particularly if you book in advance, you may find that driving is a more cost effective option. If you are holidaying in Europe, consider taking the car, travelling by ferry and then driving to your resort. This is a particularly good option if there are three or more of you, since petrol and ferry costs can be shared. If you’re feeling the pinch, you may not necessarily need to wave goodbye to your skiing break. Seek to make savings in all areas and your dream holiday may prove affordable.